Who’s pumped for March Madness?! We sure are, and as we do for other major sporting events, we’re celebrating by giving away free stuff. ScanLife will reward lucky scanners with a variety of awesome gift cards including a $500 H&M gift card, a $100 Macy’s gift card, a $50 Bloomingdale’s gift card, and a $30 Starbucks gift card. 1. Eligibility: ScanLife March Madness Giveaway (the “Promotion”) is open to U.S. legal residents who are at least eighteen (18) years old at the time of entry. Employees of Scanbuy, Inc. (“Main Sponsor”) and its affiliate companies, suppliers as well as the immediate family (spouse, parents, siblings and children) and household members of each such employee are not eligible. Subject to all applicable federal, state, and local laws and regulations. Void where prohibited. Participation constitutes entrant’s full and unconditional agreement to these Official Rules and Main Sponsor’s and Administrator’s decisions, which are final and binding in all matters related to the Promotion. Winning a prize is contingent upon fulfilling all requirements set forth herein. The Promotion consists of a sweepstakes (the “Sweepstakes”). 2. Timing: The Promotion begins on March 17th, 2016 at 2:00 p.m. Eastern Time (“ET”) and ends on April 4, 2016 at 11:59 p.m. ET (the “Promotion Period”). Administrator’s computer is the official time keeping device for this Promotion. 3. How to Enter: During the Promotion Period, open any mobile QR Code scanning application and scan the Main Sponsor’s custom QR Code, which will be accompanied by a call to action that reads “Scan the code for a chance to win” and will identify itself as a March Madness Giveaway promotion offered by ScanLife and powered by Scanbuy. Once you have scanned the custom QR Code you will be brought to a mobile landing page with a drop down menu listing the teams participating in the 2016 NCAA Men’s Basketball Tournament. 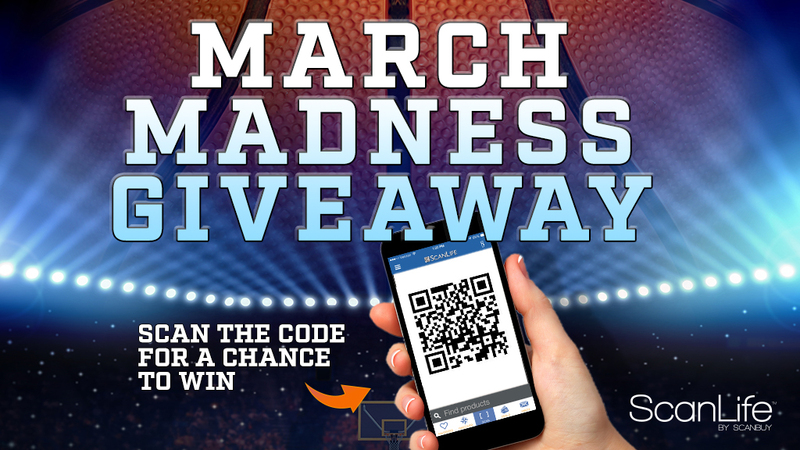 Alternatively, ScanLife or Code Scanner app users may also click on a banner that reads “March Madness Giveaway” in their app inbox to reach the mobile landing page. From there select the team you are rooting for and below the drop down menu will be a mobile registration form, fill out the registration form including a valid Email address which will be used to contact you only if you win. Once you fill out the registration form, in its entirety (e.g. provide a valid Email address and choose the team whom you are rooting for), and submit, you will be brought to a mobile landing page that will read “Thank you, you will be notified via email if you’re a lucky winner” signifying that you have officially be entered into the Sweepstakes. Limit: Each participant is eligible to receive one (1) Sweepstakes entry during the Promotion Period and to receive one (1) Sweepstakes Prize. Multiple entrants are not permitted to share the same email address. Any attempt by any entrant to obtain more than the stated number of entries by using multiple/different email addresses, identities, registrations and logins, or any other methods will void that entrant’s entries and that entrant may be disqualified. Use of any automated system to participate is prohibited and will result in disqualification. Main Sponsor is not responsible for lost, late, incomplete, invalid, unintelligible or misdirected registrations, which will be disqualified. In the event of a dispute as to any registration or play, the authorized account holder of the email address used to register will be deemed to be the registrant or player. The “authorized account holder” is the natural person assigned an email address by an Internet access provider, online service provider or other organization responsible for assigning email addresses for the domain associated with the submitted address. Sweepstakes: Administrator will randomly select four (4) potential winners from all eligible entries up to April 4, 2016. The 1st Place Prize Winner will win a $500 H&M gift card. The 2nd Place Prize Winner will win a $100 Macy’s gift card. The 3rd Place Prize Winner will win a $50 Bloomingdale’s gift card. The 4th place prize winner will win a $30 Starbucks gift card. 6. Verification of Potential Winners: Potential winners must continue to comply with all terms and conditions of these Official Rules, and winning is contingent upon fulfilling all requirements. Each potential winner will be notified by the email provided when entering. Each potential prize winner will be required reply to the email within twenty-four (24) hours of the time notice or attempted notice is sent, in order to claim his/her prize (if applicable). If a potential winner of any prize cannot be contacted, fails to reply within the required time period, or prize is returned as undeliverable, such potential winner forfeits the prize. In the event that any potential Prize Winner is disqualified for any reason, Main Sponsor will award the applicable Prize to an alternate winner by random drawing from among all remaining eligible entries. All alternate potential winners are subject to all requirements set forth in these Official Rules. Only three (3) alternate winners will be selected for any applicable Prize after which the applicable Prize will remain un-awarded. One (1) 1st PLACE PRIZE: The 1st Place Prize Winner will receive a $500 H&M gift card. ARV of the 1st Place Prize: $500. One (1) 2nd PLACE PRIZE: The 2nd Place Prize Winner will receive a $100 Macy’s gift card. ARV of the 2nd Place Prize: $100. One (1) 3rd PLACE PRIZE: The 3rd Place Prize Winner will receive a $50 Bloomingdale’s gift card. ARV of the 3rd Place Prize: $50. One (1) 4th PLACE PRIZE: The 4th Place Prize Winner will receive a $30 Starbucks gift card. ARV of the 4th Place Prize: $30.